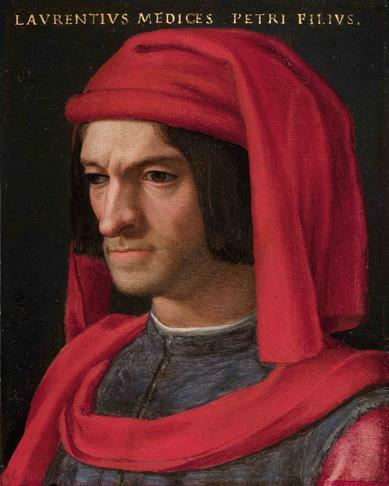 Lorenzo de’ Medici, the ruler of Florence usually known as Lorenzo the Magnificent, died on this day in 1492 in the Medici villa at Careggi, just to the north of the city. He was only 43 and is thought to have developed gangrene as a result of an inherited genetic condition. He had survived an assassination attempt 14 years earlier in what became known as the Pazzi Conspiracy, in which his brother, Giuliano, was killed. The grandson of Cosimo de’ Medici, Lorenzo was a strict ruler but history has judged him as a benevolent despot, whose reign coincided with a period of stability and peace in relations between the Italian states. He helped maintain the Peace of Lodi, a treaty agreed in 1454 between Milan, Naples and Florence which was signed by his grandfather. However, he is most remembered as an enthusiastic patron of Renaissance culture, providing support for poets, scholars and artists, notably Michelangelo and Botticelli. He contributed more than anyone to the flowering of Florentine genius during the second half of the 15th century. Respected himself for his poetry, he held lavish parties for his artistic friends at the Careggi villa and was the protector of artists such as Giuliano da Sangallo, Botticelli, Andrea del Verrocchio, and Verrocchio’s pupil Leonardo da Vinci. Lorenzo opened a school of sculpture, at which he noticed the great talent of a 15-year-old pupil called Michelangelo Buonarroti, whom he took under his wing and brought up like a son. Sandro Botticelli repaid his patronage by using Medici family members as models in some of his most famous religious paintings. In his Madonna of the Magnificat, for example, one of the figures is Lorenzo, while the Madonna is his mother, Lucrezia Tornabuoni. 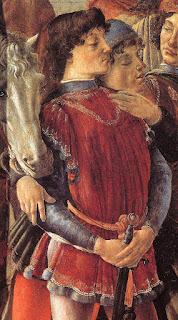 Lorenzo also appears in Botticelli’s Adoration of the Magi, while Mars in his Mars and Venus is Lorenzo’s brother, Giuliano. In addition to his patronage of artists, Lorenzo also expanded the collection of books begun by Cosimo, which became the Medici Library. He retrieved large numbers of classical works from the East, which he had copied and shared with other countries across Europe. He also supported philosophers such as Marsilio Ficino, Poliziano and Giovanni Pico della Mirandola. Although the assets of the Medici bank were diminished during Lorenzo’s rule, partly through the family focussing more on power than the actual source of their power, i.e. money, they were still not short of jealous rivals and the Pazzi family fell into this category. With the support of Pope Sixtus IV, Francesco Pazzi conspired with Girolamo Riario, the Lord of Imola, and Francesco Salviati, the archbishop of Pisa, to attack Lorenzo and Giuliano, who were joint rulers of Florence at the time, during High Mass at the Duomo. The goal was to kill both and seize power, but while Giuliano was being stabbed to death Lorenzo escaped into the sacristy, where he hid from the assassins. The coup d’état therefore failed and it is estimated that around 80 people, either conspirators or their associates, were captured and executed in the months that followed. Controversially, it was Lorenzo de’ Medici, taking advice from his friend, Giovanni Pico della Mirandola, who was responsible for the return to Florence of the firebrand priest Girolamo Savonarola, who had left his position at the Convent of San Marco some years earlier after proposing sweeping reforms to the Catholic Church. Savonarola’s preaching, in which he railed against despotic rulers and the exploitation of the poor, and persuaded people that works of art and literature were sinful and should be destroyed, would eventually provoke the overthrowing of the Medici family. Florence has a wealth of preserved antiquity, but one of the finest examples of true Renaissance architecture is the Palazzo Pitti - the Pitti Palace - which was originally commissioned in 1458 as a house for the Florentine banker Luca Pitti, a friend and supporter of Cosimo de’ Medici. Designed by Luca Fancelli, a pupil of Filippo Brunelleschi, it is characterised by a strong, symmetrical structure, wide arches and rusticated stone pillars and walls. It was later sold to Eleonora di Toledo, wife of Cosimo I de Medici (not to be confused with Cosimo de’ Medici, who came from a different branch of the family) , and remained in the Medici family for centuries. Today it houses the biggest museum in Florence and a number of art galleries, and looks out across the Boboli Gardens, created on land Eleonora bought from the wealthy Boboli family. In common with his grandfather, Cosimo, Lorenzo died at the Villa Careggi, originally a working farm acquired in 1417 by Cosimo’s father to make his family self-sufficient. Cosimo employed the architect Michelozzo to remodel it around a central courtyard overlooked by loggias. Lorenzo extended the terraced garden and the shaded woodland area. Careggi, which is not far from Florence’s airport, is nowadays a suburb of the city, about 8km (5 miles) northwest of the centre.